This image portrays the differences between a healthy lung and a lung that has been affected by COPD. When a person has COPD, the amount of air that is transferred in and out of the airways is reduced for one of a few reasons. The reasons for this reduction could include: the airways and air sacs have lost their elastic quality, the walls between many of the air sacs have been destroyed, the walls of the airways have become thick and inflamed, or that the airways produce more mucus than normal, which clogs the airways. COPD can be broken down into two main conditions: emphysema and chronic bronchitis. When someone has emphysema, the walls between many of the air sacs have become damaged, which causes them to become loose and floppy. This can also destroy the walls of the air sacs themselves, resulting in only a few large air sacs rather than the many necessary small ones. In contrast, chronic bronchitis causes long term swelling and a large amount of mucus in the main airways of the lungs. This image depicts the leading cause for COPD, smoking. Chronic obstructive pulmonary disease is often addressed in stages. These stages are defined by a person’s symptoms as well as a measure of how well their lungs work (lung function). FEV1 is a test result that shows how fast a person can breathe out of their lungs. It stands for Forced Expiratory Volume in one second. FEV1 is measured by machines called spirometers. The test result is expressed as a percentage of normal. For example, an FEV1 of 100% would mean that the lungs are working normally, 80% is below normal, and 30% is far below normal. It is important to keep in mind as you read the following information that not everyone who has COPD will experience all of its symptoms; likewise, a person with these symptoms may not be experiencing COPD. If a person is experiencing the following symptoms, it is important for them to visit their doctor and possibly undergo a series of tests to reach a professional clinical diagnosis. 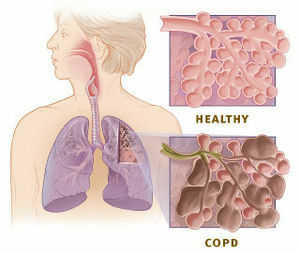 The stages of COPD can range from mild to very severe. At stage one, or mild COPD, a person begins to experience chronic coughing that often brings up mucus from the lungs. At this stage, the lung function (FEV1) is at 80% or higher. At stage two, or moderate COPD, a person will experience a more severe chronic cough which produces mucus. They will also begin to experience shortness of breath, especially during physical exertion. The person will also have occasional COPD flare-ups, also called exacerbations. A flare-up is defined as an instance where a person’s breathing and coughing symptoms suddenly become and remain more severe. With treatment, it is possible to recover and return to the same level of shortness of breath that the person had before the attack. These attacks are often life threatening and it is best for a person experiencing one to seek immediate medical attention. At stage two, a person’s lung function FEV1 ranges from 50% to 79%. Stage three, also referred to as severe COPD, is identified by a chronic cough with a continued increase of the presence of mucus. It is also identified by shortness of breath and weight loss. At this stage, a person will begin to experience more frequent and sometimes more sever COPD flare-ups. During this stage, a person is expected to have a lung function FEV of 30% to 49%. 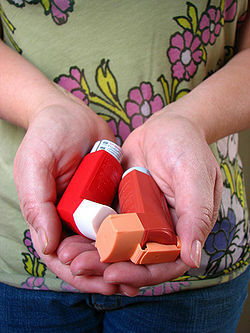 This is an image of inhalers used as treatment for COPD. The most important treatment for a smoker who has COPD is to quit smoking. 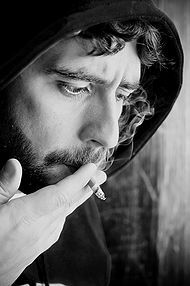 Cigarette smoke itself can provoke lung deterioration and when accompanied with deterioration from something else, even as simple as ageing, it has profound effects. It is very difficult for smokers, especially longtime smokers, to quit because of their nicotine addiction. Some ideas to keep in mind when trying to quit are using nicotine gum or nicotine patches; getting into a support group, whether it be your family or a private group; and remembering that it is for the overall benefit of your health. There are several drugs that a person can administer to lessen the effects of COPD. Bronchodilators are medications similar to ones used to treat bronchospasm in asthma. Their function is to relax the muscles surrounding the small airways; thereby opening them. Bronchodilators can be inhaled, taken orally, or administered intravenously. Inhaled bronchodilators are the most popular because they go directly to the airways where they are needed. Metered dose inhalers (MDIs) are used to deliver bronchodilators. A MDI is a pressurized canister which contains a medication that is released when the canister is compressed. A standard amount of medication is released each time the MDI is compressed. To maximize the delivery of the medications to the airways, the patient has to learn to inhale simultaneously with each compression. Incorrect use of the MDI can lead to deposition of much of the medication on the tongue and the back of the throat instead of in the airways. To decrease the deposition of medications on the throat and increase the amount reaching the airways, spacers can be utilized. Spacer devices can hold the released medications long enough for patients to inhale them slowly and deeply into the lungs and therefore greatly increase the proportion of medication reaching the airways. Beta-2 agonists are another medication administered to relieve effects of COPD. Beta-2 agonists can be administered by MDI inhalers or orally. Activation of beta-2 receptors relaxes the muscles surrounding the airways and opens the airways. Dilating airways helps relieve the symptoms of dyspnea, shortness of breath. Beta-2 agonists have been shown to relieve dyspnea in many COPD patients, even among those without possibilities of reversing airway obstruction. The action of beta-2 agonists starts within minutes after inhalation and lasts for about 4 hours. Beta-2 agonists are especially helpful for patients who suffer from severe shortness of breath because they act so quickly. This qualifies them as rescue inhalers. Because of their short duration of action, these medications are for symptoms as they develop rather than for maintenance. Evidence suggests that when these drugs are used routinely, their effectiveness is weakened. Examples of beta-2 agonists include: albuterol, metaproterenol, pirbuterol, terbutaline, isoetharine, and the newly approved Levalbuterol. Some Beta-2 agonists have a slower onset of action but a longer period of activity, such as salmeterol xinafoate, and formoterol fumarate. These drugs may be used routinely as maintenance medications. The drugs last twelve hours and should be taken a maximum of twice daily. Side effects of beta-2 agonists include anxiety; tremors; palpitations, or fast heart rate; and low blood potassium. Acetylcholine is a chemical released by nerves that attaches to receptors on the muscles surrounding the airway, causing the muscles to contract and the airways to narrow. Anti-cholinergic drugs, such as ipratropium bromide, dilate airways. This is accomplished by blocking the receptors for acetylcholine on the muscles of the airways and preventing them from narrowing. Ipratropium bromide is usually administered with a MDI. In patients with COPD, ipratropium has been shown to alleviate dyspnea, improve exercise tolerance, and improve FEV1. Ipratropium has a slower onset of action but longer duration of action than the beta-2 agonists. Ipratropium is usually well-tolerated with minimal side effects even when used in high doses. Tiotropium (SPIRIVA) is a long-acting and more powerful version of Ipratropium and has been shown to be more effective than other forms. In comparing ipratropium with beta-2 agonists in the treatment of patients with COPD, studies suggest that ipratropium may be more effective in dilating airways and improving symptoms with fewer side effects. Ipratropium is especially suitable for use by elderly patients who may have difficulty with side effects of the beta-2 agonists such as fast heart rate and tremors. In patients who respond poorly to either beta-2 agonists or ipratropium alone, a combination of the two drugs sometimes results in a better response without any additional side effects. Theophylline and aminophylline are both examples of methylxanthines. Methylxanthines are either administered orally or intravenously. Long acting theophylline preparations can be given orally once or twice a day. Theophylline, like a beta agonist, relaxes the muscles surrounding the airways but also prevents most cells around the airways from releasing bronchoconstricting chemicals such as histamine. Theophylline also can act as a mild diuretic and increase urination. Theophylline also may increase the force of contractions of the heart and lower pressure in the pulmonary arteries. Thus, theophylline can help patients with COPD who have heart failure and pulmonary hypertension. Dosages and blood levels of theophylline or aminophylline have to be closely monitored. Excessively high levels in the blood can lead to nausea, vomiting, heart rhythm problems, and even seizures. In patients with heart failure, or cirrhosis, dosages of methylxanthines are lowered to avoid high blood levels. Interactions with other medications can also alter blood levels of methylxanthines. When airway inflammation contributes to airflow obstruction, anti-inflammatory medications called corticosteroids may be beneficial. Examples of corticosteroids include Prednisone and Prednisolone. Twenty to thirty percent of patients with COPD show improvement in lung function when given corticosteroids by mouth. Unfortunately, high doses of oral corticosteroids over long periods of time can have serious side effects including osteoporosis, bone fractures, diabetes mellitus, high blood pressure, thinning of the skin and easy bruising, insomnia, emotional changes, and weight gain. Therefore, many doctors use oral corticosteroids as a last resort treatment. When oral corticosteroids are used they are prescribed at the lowest possible doses for the shortest period of time to minimize side effects. When it is necessary to use long term oral steroids, accompanying medications are often prescribed to help reduce the development of possible side effects. Corticosteroids can also be inhaled. Inhaled corticosteroids have less effects than long term oral corticosteroids. Examples of inhaled corticosteroids include beclomethasone dipropionate, triamcinolone acetonide, fluticasone, budesonide, mometasone furoate and flunisolide. Inhaled corticosteroids are usually utilized for treating patients with asthma rather than the oral forms. However, it is not yet clear whether inhaled corticosteroids have the same benefit as oral corticosteroids when it comes to COPD patients. Nevertheless, doctors are less concerned about using inhaled corticosteroids because they have fewer side effects. These side effects include hoarseness, loss of voice, and oral yeast infections. There are also other steps a person can take to relieve symptoms of COPD without utilizing drugs. When a person with COPD remains active, they are less likely to have shortness of breath. It will most likely also improve their outlook on life and prevent them from falling into depression. People with COPD are more prone to illnesses, especially pneumonia and the flu. It is wise for them to wash their hands often, avoid people who are sick, and possibly get an annual flu shot. It is also important to eat healthy to keep up their immune system and overall health. It is best for a person with COPD to distance themselves from anything that could trigger a flare-up. Such things could include indoor and outdoor air pollution, cold dry air, hot humid air, and high altitudes. It is important for people who have COPD to learn ways to breathe that improve airflow in and out of their lungs. It is also smart for them to find ways to clear their lungs to save energy and oxygen. There are also more severe measures that a person with COPD could take in attempt to slow or reverse its effects. This is an image of an IPPB machine used to administer medications to patients who are not able to breath normally. In cases with hypoxemia (low blood oxygen) supplemental oxygen is prescribed to improve the physical and mental functioning of patients. Several studies have shown greater long-term survival in patients with severe COPD who received oxygen therapy than those who did not. This image is of a lung diseased with emphysema. This page was last modified on 24 July 2014, at 18:28.